Geneva 2012: Citroen DS4 Racing Concept | What Car? This is the Citroen DS4 Racing Concept, which will make its debut at the Geneva Motor Show 2012. As with 2010s DS3 Racing, the DS4 Racing production car is expected to be a limited-edition flagship model, although exact production numbers are yet to be confirmed. Like the DS3 Racing, the DS4 Racing Concept has a muscular makeover, with bulging wheelarches, deep bumpers and bespoke 19-inch alloy wheels. 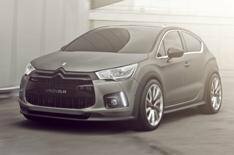 Theres also carbonfibre trim for the front bumper splitter, grille and air diffuser, a two-tone roof and textured-effect matte grey paint, which Citroen says is a first for the automotive industry. Citroen has tweaked its 1.6-litre turbocharged petrol engine to produce a remarkable 256bhp, with CO2 emissions of just 155g/km. The suspension has been lowered by 35mm and the track widened by 55mm at the front and 75mm at the rear, compared with the current range-topping 200bhp DSport edition. Ctiroen says performance is further enhanced through a redeveloped running gear, while the braking system gains fixed four-piston callipers and 380mm diameter discs. The production version of the DS4 Racing Concept will be a rival for high-end hot hatches such as the new Ford Focus ST, the Renault Megane Renaultsport and the Vauxhall Astra VXR. Prices for the Citroen DS4 Racing are likely to start from around 28,000.